The spectacular Disney World Theme Park is a myriad of worlds encompassed in over 25,000 square acres of property in Orlando, Florida. 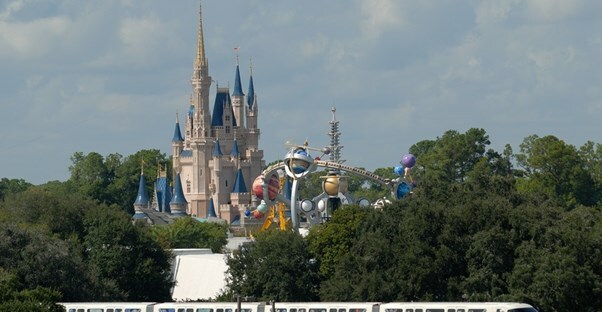 Disney World is the largest and most-visited theme park in the world with 24 on-site resorts for lodging, two huge water parks, five professional golf courses, and four miniature golf courses. Disney World provides entertainment, rides and attractions, educational opportunities, and an international array of dining opportunities for guests of all ages. Disney World was the second themed amusement park brain-child of Walt Disney. It was originally designed to be an expanded version of his beloved Disneyland in Anaheim, California. Walt unveiled his vision of Disney World in 1964 on his Magical World of Color TV show. Walt's original dream included genuine living communities for his animators and employees. Sixty years later, those communities have become a reality. Disney World consists of four theme parks and a designated shopping, dining, and nightlife complex called Downtown Disney. Downtown Disney is a vast-yet-quaint outdoor entertainment promenade lined with an international array of cafes, nightclubs, a movie theater complex, and shopping venues. The popular World of Disney store contains vintage books and hard-to-find items as well as traditional souvenirs. One of the most popular attractions in Downtown Disney is the spectacular Cirque du Soleil show La Nouba. Another is the Disney Quest Indoor Interactive Theme Park Arcade. The Magic Kingdom was the first theme park of Walt Disney World. It is an expanded version of Disneyland with beloved Main Street, Fantasyland, Tomorrowland, Adventureland, and Frontierland. The Magic Kingdom is renowned for the classic Cinderella Castle, fairy tale ambiance, and iconic Disney characters. Epcot is easily recognized by its massive golf-ball-like geosphere named Spaceship Earth. Its interior is divided into two sections called World Showcase and Future World. World Showcase is composed of pavilions representing 11 nations, and contains dining areas, shopping venues, entertainment, and architectural attractions. Future World is composed of pavilions dedicated to the environment, energy, space, the imagination, technology, and the automotive industry. Disney's Animal Kingdom is an animal-based theme park and safari park with realistic nature settings and real exotic animals. Guests can take a three-mile hike, an off-road trek, or a safari ride through live-animal habitats. The Animal Kingdom also has a thrilling rollercoaster ride called Expedition Everest that features a real elephant and a real lion. Disney's Hollywood Studios is a movie-themed theme park with two of the most thrilling and scary rides in Disney World, called The Great Movie Ride, and The Legend of Jack Sparrow; and the extremely popular Star Tours ride. There is an extreme stunt show, and a fun new area that is themed after Pixar Movies called Toy Story Mania. There are also walk-through exhibitions dedicated to iconic Hollywood movies. The Magic of Animation exhibition is an interactive experience for art enthusiasts. The vast Disney World is indeed a spectacular world of its own. A person could easily take a month or more to experience everything that Disney World has to offer.